Could Dilbert’s ‘mean’ robot be logical? You never know where or when you’re going to bump into a logical syllogism. Or shall I say an ATTEMPT at a logical syllogism. I scan the daily paper, including the comics, for interesting and challenging blog topics. I chuckled recently when I read Scott Adams’ Dilbert cartoon featuring a news anchor robot that sports a bad attitude. When I encounter a statement like that, my logical antennae tend to perk up. Why? Because I’ve just met a CONCLUSION. Now I need to hunt for the argument, also known as the reasons. Scan on with me! Lawyers argued that any good engineer knows how to get away with murder, so getting caught is proof of innocence. This statement appears to be an argument in itself. The telltale two-letter word, SO, often introduces a conclusion. Yet when I tried to tease out the assumptions lurking in this complex sentence I got bogged down. How is ‘good’ being defined? And who is doing the defining? Is there a hidden assumption that a good engineer might actually commit murder but be capable of concealing it so that he can’t be charged as ‘guilty’? Since this logical workout comes from a ‘tongue-in-cheek’ comic strip, we mustn’t take it very seriously. But I did attempt to represent it with a Venn diagram. There is not enough information given in the 3-panel cartoon strip to know how to portray the non-good engineers. Are they engineers who commit murder and get caught? 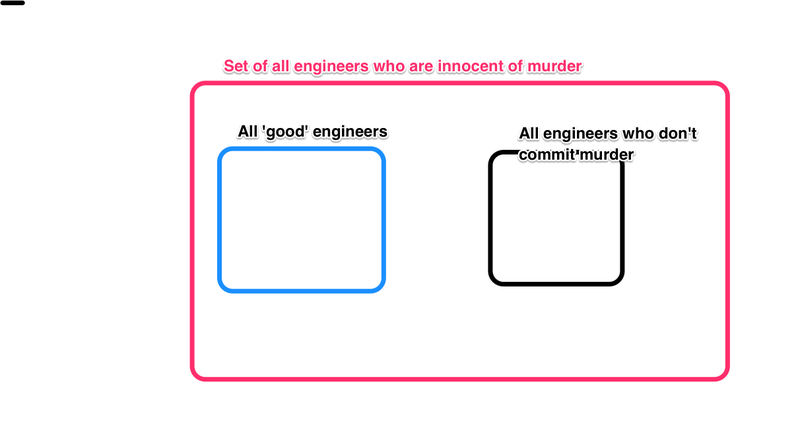 Or does the concept of ‘good’ engineer include any other talents than the ability to get away with murder? How and where do I draw THAT set? Where are there intersections of sets? I’m not too bothered that I didn’t dissect it to the satisfying point of seeing how it worked. Why not? Too many fallacies and problems that I don’t have the energy to sort out! So I’ll call it ‘a day’ and lay aside my cartoon logic analysis. Nonetheless, I’m grateful for the 30 or so minutes I invested in playing around with Scott’s wording. Actually, the process of drawing different category sets and subsets helped me think. And thinking is never a waste of time. So what if I had to conclude that I was dealing with some crazy robot’s irrational news reporting! The ruling was unanimous because no one could figure out which side was the liberal one. Maybe I spent my energy on the wrong parts of the cartoon! Oh, well. I enjoy challenging myself to think through assertions, whether encountered in conversations, in my reading or in movies. Wanting to grow wiser, my goal is to become quicker to think and reflect and slower to share my views. Join me in being on guard, with a nose ready to sniff out poor reasoning and irrational statements.